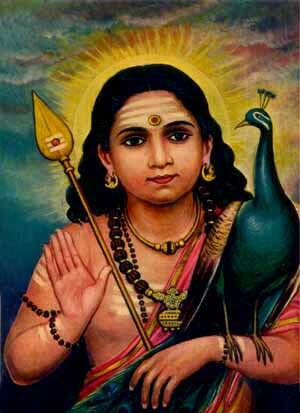 Śrī Jñāna Pandita: Kataragama Murugan as Expositor of Gñosis with His symbols the Vēl or Spear of Wisdom and vehicle/totem the peacock = Phoenix. Behind Him dawns the rising sun symbolising the awakened mind (bodhi). 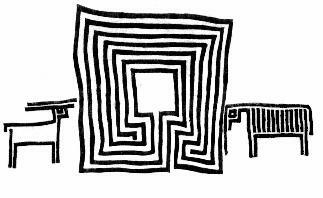 Below: In other cultures too the labyrinth has long been a visual metaphor for the journey to the spiritual center. Click to generate a labyrinth puzzle. 'If you know the way, you come to Kataragama. Kataragama is more than a marvelous place in the jungle, for it is also a very special place in the human heart. The way to this sacred shrine is not found in any mapy or book, but can be found only by those bold enough to enter its beguiling ways and byways. Kataragama-Skanda, the shrine's presiding deity and renowned Master Thief of Hearts, is also called Guha, the Hidden One dwelling in the innermost chamber of one's own heart. In the yogic tradition of Kataragama, the pada yatra or foot pilgrimage is but an outward reflection of the subtle inward pilgrimage ever-deeper into the heart of Kataragama's living mystery. Many roads and paths of thought wind through the vast three-dimensional yantra that is Kataragama, the 'place of light and love', are intricately interwoven. All lead from this outward world of darkness and shadows towards the inner 'Kingdom of Light and Love', at the center of which dwells the one inscrutable Knower and Source of all life, the inseparable Companion and eternal Friend who is, ultimately, one's own Self. Traditional pilgrims and devotees regard themselves as the royal subjects (Tamil adiyārkal, literally 'slaves') or petitioners awaiting the divine audience with their tender Lord or Kumara Swami whom they adore and love. The devotee, enthusiast or bhakta (literally, 'participant') who hears and answers the 'call' from within ultimately discovers him- or herself engaged in activities that are very much real and far more meaningful than mere words can express. The same living tradition assures us that the whole of Kataragama and Deviyange Kaele ('the God's own Forest') is riddled inside and out with hidden passageways accessible to sages and devotees, spirits and divinities, since remote times and whereby one could pass from one realm or loka to another and back in the blink of an eye. 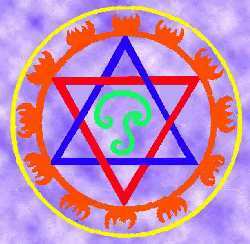 These are the secret routes of wisdom accessible to those whose vision has been purified by inward meditation and the fire of gnosis (Sanskrit: jnana) or intuitive understanding. Lord Kataragama-Guha is also well-known as the playful and even mischievious master of deception or maya, high magical tricks and terrible surprises for unbelievers. Sceptics and unbelievers are continually confounded by Kataragama's subtle defences against unwelcome trespass by unwary intruders. Taken together, these inward and outward pathways of the heart form the labyrinth, the maze that continually amazes with its infinite possibilities. Small wonder, then, that Lord Guha is spoken of as the Lord of the Labyrinth, the divine guide and supreme magician at the heart of His mystery of all mysteries.